In March, a dozen YOBC students had the opportunity to perform for two world-class musicians at master classes on their instrument. In a violin master class, David Kim, Philadelphia Orchestra concertmaster, gave students tips and routines to build confidence and help overcome nerves, explored how to slow down the tempo to improve muscle memory, and demonstrated tricks for a perfect vibrato. 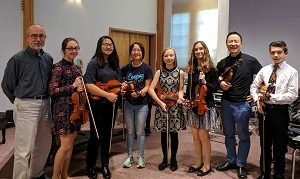 YOBC student performers representing Concertino, Ripieno, Philharmonia, and Symphony Orchestra included: Aneta Sieminski, Anna Kim, Hannah Kim, Brooke Lion, Danielle Gershman, and Christian Teufel. YOBC trombonists attended a class given by Matthew Vaughn, co-principal trombone at the Philadelphia Orchestra. Students from all three wind groups – Wind Symphony, Wind Ensemble, and Fanfare Winds – performed for Mr. Vaughn and received instruction on breathing, slide control, and the perfect embouchure. YOBC trombonists who performed were: Catie Chalupa, Josif Collazo, Phoebe Child, Catie Smith, Dylan Waddell, and Noah Harrison. 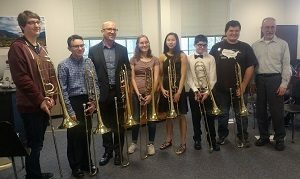 The trombone master class was open to the public and a dozen trombonists from local high schools and universities had the opportunity to sit in and absorb the lesson and ask questions at the end. YOBC is continuing to developing its relationship with the Philadelphia orchestra in order to keep providing these and similar events. Where in the World Is Erica Cherry?